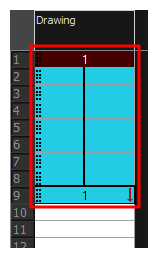 You can fill a selection with the same drawing using the Fill Selection dialog box. You can fill a selection of a single drawing, several drawings or even several columns. From the top menu, select Animation > Cell > Fill Selection. Press Ctrl + T (Windows/Linux) or ⌘ + T (macOS)).